One hundred years ago, the world was ravaged by an epidemic just as the First World War was wrapping up. The 1918 influenza outbreak, also known as the Spanish flu, killed at least 40 million people worldwide and infected many more, according to the World Health Organization. 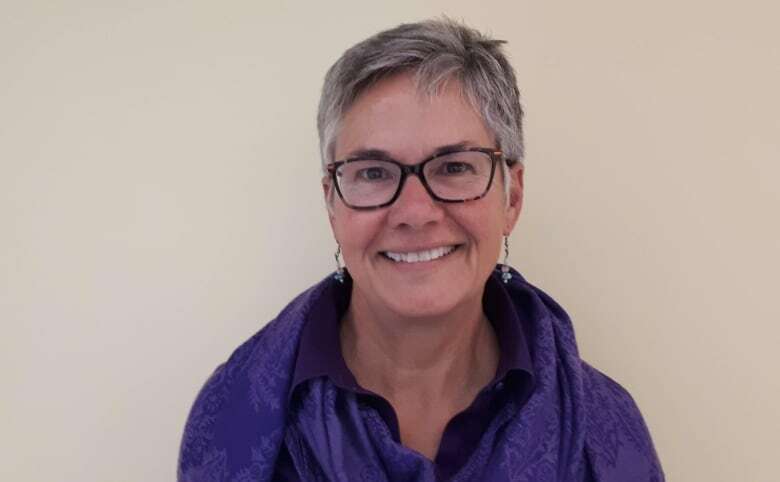 Jane Jenkins, the director of science and technology studies at St. Thomas University, said New Brunswickers were used to the flu that would come and go every year, but the 1918 virus was different. Heroism and tragedy of 1918 Spanish flu remembered in N.L. Archeologists dig up history of men lost to Spanish Flu in Matapédia, Que. "It hit suddenly and people could be dead in 12 to 20 hours," said Jenkins. "I mean, the symptoms were devastating. The impact was devastating. The other thing that made it really unusual was that it hit young people, people in their twenties." Newspaper articles from the time show just how quickly the flu could kill someone. A report from Grand Falls printed in the Oct. 25, 1918, edition of the Daily Gleaner told the story of Matthew Burgess, who died of pneumonia. The article said it develops from the flu. "He was in his office at 11 o'clock this morning, but was obliged to return home," read the account. "He died about 5 p.m."
Accounts also indicate many of the flu's victims were younger individuals. 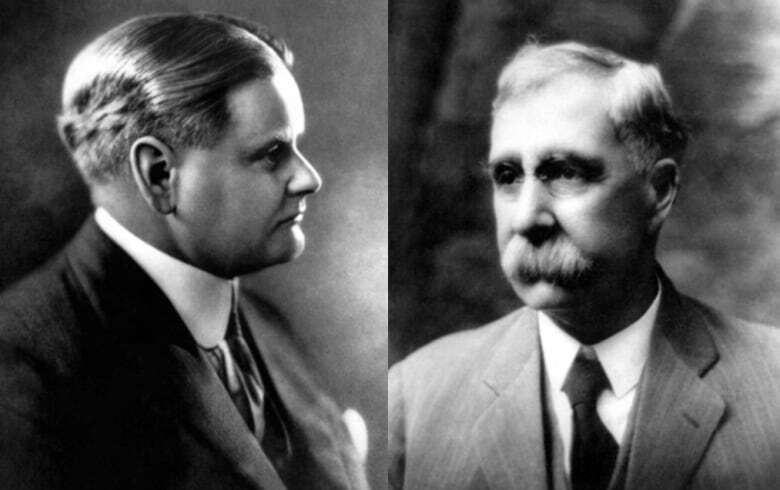 Burgess was only in his 40s, and the same edition of the newspaper reported on the death of local businessman W. Kenna Allen. "It is a coincident worthy of note that the deceased was born 24 years ago in the home in which he died," read the article. While no area of the province was spared, accounts at the time suggest the north of the province was the worst hit, with the Edmundston area reporting 1,600 cases as of Oct. 17, 1918. 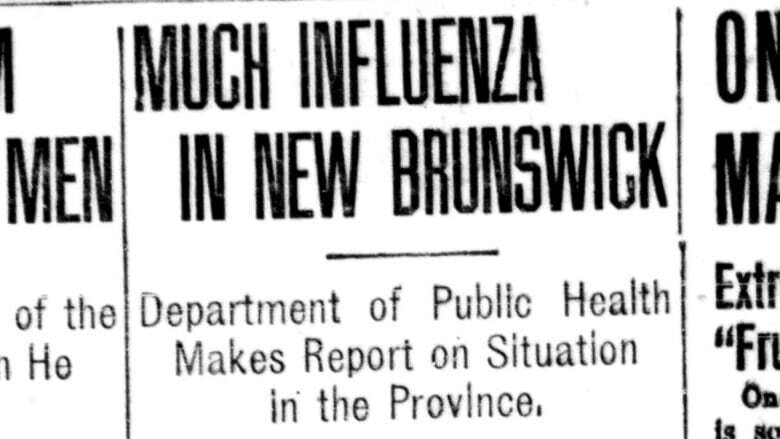 Jenkins said that 1918 New Brunswick didn't really have any infrastructure in place to deal with epidemics like the Spanish flu. "The notion of a 'public' was really just beginning to emerge at that time in the beginning of the 20th century," said Jenkins. But that soon changed. Just before the flu outbreak, the province appointed its first minister of health, the first one in the British empire. William F. Roberts, a Saint John doctor, saw the need for a greater focus on public health from the government. He ran in the 1917 provincial election and won a seat in Saint John for the Liberals, the party that formed a majority government. It was only through a lot of negotiation and threats of resignation, that Roberts was able to persuade his colleagues to support the creation of a new department with him as the minister. While they didn't know it at the time, the government couldn't have waited any longer. "The first provincial Department of Health had just been established, literally, days before the first cases of influenza broke out," Jenkins said. 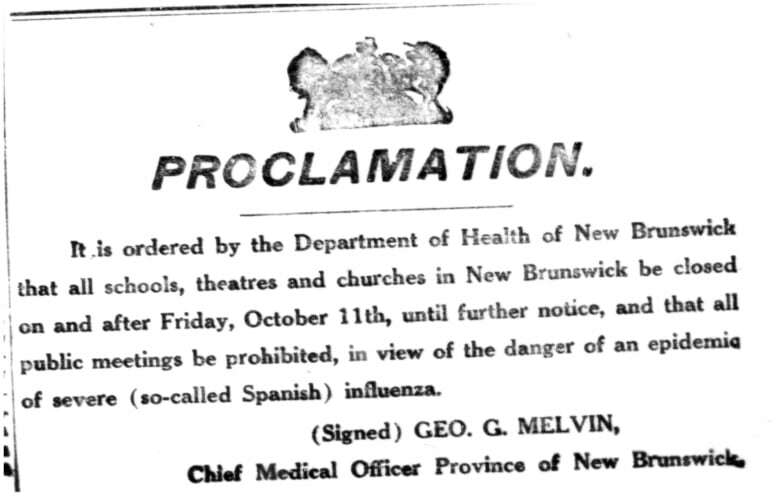 The first act of the new department, and of the first chief medical officer of health, Dr. George Melvin, was to shut down a great deal of the province to help curb the spread of the flu. Melvin issued a proclamation on Oct. 9, 1918, that all schools, theatres and churches were to close two days later. Public meetings were also prohibited. Businesses were allowed to stay open, but owners were warned not to have too many people in the store at once. Loitering was forbidden. Funerals were to be strictly private affairs with only the deceased's closest family present — a move that was, to say the least, controversial. 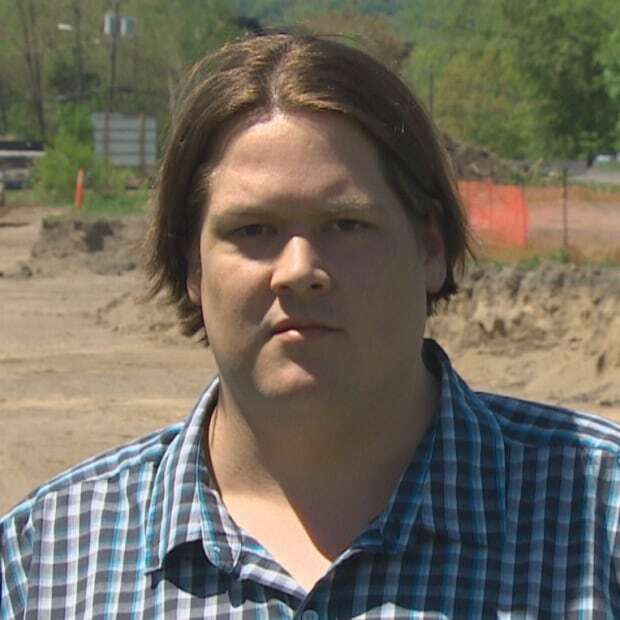 "He got letters from the president of the University of New Brunswick saying that the students were all healthy young men and they shouldn't have to go home, the term had just started," said Jenkins. "He got letters from the top church officials saying that there was no time like then, when there was a war going on, when church services were more needed. And they pleaded with him to keep the churches open." The flu epidemic didn't stop some New Brunswickers looking to make a quick buck off people's fears about the flu. 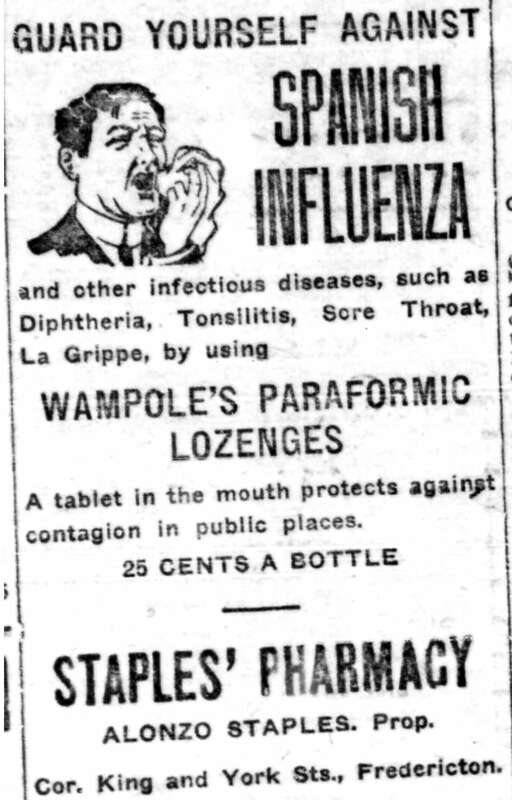 Alonzo Staples, the owner of Staples' Pharmacy, which sat at the corner of King and York streets in Fredericton, urged readers of the Daily Gleaner to "Guard yourself against Spanish Influenza" by buying Wampole's Paraformic Lozenges, only 25 cents a bottle. 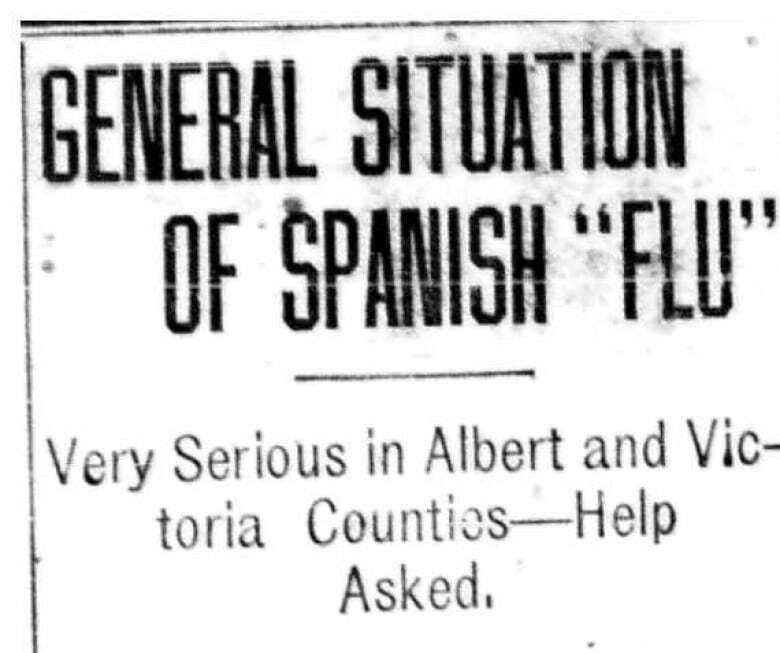 One advertisement disguised to look like an article, possibly predicting the advent of sponsored content, ran with the headline "Spanish influenza rages in Canada: Thousands of cases reported with many deaths." The ad was for "Fruit-A-Tives," described as "the wonderful fruit medicine. Gives the power to resist the disease." 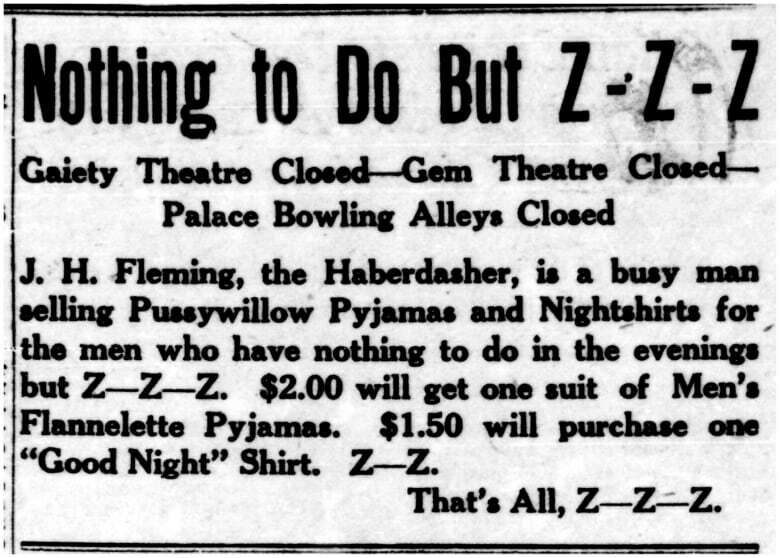 Another ad lamented that with the Gaiety and Gem theatres closed, as well as the Palace Bowling Alley, there was "nothing to do but z-z-z." They suggested doing so in a pair of Pussywillow Pyjamas, available for only $2. The epidemic brought a sense of community to the province, even if residents weren't able to gather together. In an interview conducted by writer Eileen Pettigrew, which is now part of the Provincial Archives audio-visual collection, a former Tabusintac resident Helen Murphy talked about her mother pitching in. "[My mother] went out and nursed a lot of people," said Murphy. "She wasn't a registered nurse or anything, just a kind woman, and she went out to help until she took it herself. She used to go out and put poultices on her neighbours and sit up with them, and then when she took it she wasn't very well for a long time either." Jenkins said that Roberts was key in getting community members to help each other in their time of need. "He was able to gather together volunteers and get the boy scouts going around chopping wood for people and all of the women's institutes got together, and volunteer nurses, and he organized that," said Jenkins. Jenkins said four in every 1,000 New Brunswickers died — that's 1,400 in the population of 350,000 at the time. "New Brunswick fared pretty well," said Jenkins. "I suggest it fared well because Roberts shut the province down and kept people from infectious crowds."